Dagger Gordon with his Collings MT Mandolin. Photo credit: Christine Martin. The town of Invergordon is located on the eastern side of Scotland on the North Sea, a small port town that's maybe an hour's drive North of the top end of Loch Ness. A few kilometers outside of town you'll find the home of David "Dagger" Gordon - performer, author, teacher and a remarkable mandolin player whose music and contributions to this site I've enjoyed for years. His days participating in the Mandolin Cafe forum go back at least ten years but his mandolin playing days stretch back into the early 1970s when he was a student at Scotland's University of Stirling. With precious little mandolin presence existing in the traditional music of Scotland, Dagger forged his own way forward determined the mandolin was his instrument of choice. He's recognized as one of the leading traditional instrumentalists in Scottish music, and one of the very few with expertise in how its interpreted on mandolin. Not content to just perform and teach, he most recently authored The Scottish Mandolin Tutor and is in the process of recording his third solo mandolin recording, this one accompanied on guitar by his son Colin. We asked the Mandolin Cafe's ace system administrator Dan Beimborn, himself an expert in Scottish and Irish music, to visit with Dagger about the music of his home land and life as a farmer and mandolin player. So sit back and relax, enjoy Dagger's music and this marvelous virtual taste of the Highlands of Scotland! Dan Beimborn: We've had some spirited discussions recently on the message boards relating to playing in sessions. What do you think makes for an ideal session? 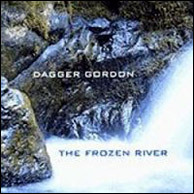 Dagger Gordon: I think you probably need a common stock of tunes which everybody involved knows and is happy to play. And within this, there should be scope for people to throw in some current favorites of theirs which they think people might like. It's best to avoid tunes you've written yourself which nobody will know (unless perhaps they've been requested). The repertoire of a session can vary a lot. Sometimes it can be quite Irish and at other times it may be dominated by Scottish bagpipe tunes. A good mix is probably best. Dan Beimborn: What are the social considerations needed for a session to thrive? Dagger Gordon: With regards to social considerations, good manners and courtesy are as important in a session situation as any other. If someone is obviously quite new to it, they should be encouraged to join in. At the same time, if you find a situation where a number of top players are involved, it is good to enjoy the moment and let them go for it, joining in where you can. Dan Beimborn: We understand that you frequently play ceilidhs, weddings, and in other situations that involve tailoring the music for traditional dance. How has this influenced your playing? What do you feel is different about traditional players who haven't played for dancers? Dagger Gordon: If you play for dancing, first of all you need to know exactly what tunes to play for each dance. Then you need to play them at the right tempo, and give them a bit of lift. Good key changes from one tune to the next always help. Traditional players who haven't played for dancers? Actually, when I think about that, part of me says there is no such thing. I'm not sure you can really be considered to be a traditional musician if you haven't played for dances, because that is traditionally the main role of local musicians. However, I do understand what you mean. I think timing is probably the main thing I would notice, and perhaps a tendency to try to play too fast. Note that when I say lift in the music, I don't necessarily mean playing faster, although certainly you don't want it to drag. I think it's good to know how to do the dances yourself, incidentally, because then you will soon find out if the tempos are OK! I remember that there was a thread on the Cafe a wee while ago called Do you dance? I was interested to see that many players didn't dance at all. Still, while playing for dancing will almost certainly leave a mark on your playing, it's not the only thing most musicians do, and you would probably present your music a bit differently if you were doing a concert performance, a pub gig or indeed something like an old folks home. Dagger and Colin Gordon playing Johnny Cope/The New Claret at Ceolraidh in 2006. Dan Beimborn: Your book The Scottish Mandolin Tutor was published about a year ago. What kind of response have you received in regard to it? The reviews and comments we've seen have all been quite favorable. Dagger Gordon: The book seems to have been very well received by everyone, I'm glad to say. People who have gone to my Loch Ness classes seem to think that I have managed to convey my teaching methods onto the printed page. I think at the very least it had a good selection of Scottish tunes for people to learn. Dan Beimborn: Your choice of mandolins covers a very broad range: a 10-string Sobell and a Collings f-holed A model. What types of musical situations make you reach for one instrument or the other? What do they both do best? Dagger Gordon: I've had my Sobell mandolin since the early 1980s, and it's my main instrument. It's got a beautiful sound and I never tire of playing it. It's what I nearly always play on stage, though my Collings MT has probably got better projection in a session situation. I always use the Collings for teaching purposes, including the CD accompanying the The Scottish Mandolin Tutor because it has eight strings and wouldn't confuse students in the way a ten-string instrument might. It's probably fair to say that Sobell instruments have a very distinctive sound, and they usually have a lot of sustain. I like sustain and overtones. My Collings has also got pretty good sustain, actually, and it's LOUD! It's a really good instrument, although it's the least expensive one they make. I should probably say that I also sometimes use a tenor banjo and a Sobell octave mandolin. 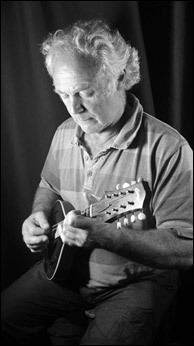 Dagger Gordon's The Scottish Mandolin Tutor can be purchased in the U.S. directly from Elderly Instruments. Dan Beimborn: What influence has your lifestyle and location in the Highlands had on your music style or repertoire? What styles and tune types are most common in your area? Dagger Gordon: Well, music isn't really the main thing I do. I have a farm up here in the Highlands where I breed sheep and cattle. I have to juggle my musical activities around my farming commitments. During the lambing, for example, I don't do any music. But, I like the combination. Farming can be quite a solitary occupation, so playing music is a good contrast. I like being out of doors. Over the years I have got used to managing on fairly little sleep. In regards to my location, I feel that the Scottish Highlands is a pretty special part of the world. Musically, it is very influenced by our Gaelic culture and has a strong regional identity. We have a thing called the Feisean movement up here, which is essentially to do with promoting Scottish—and particularly Highland—music and culture. Largely as a result of this, we now have a situation where young people think it is quite "cool" to play Scottish traditional music. I am fairly involved with this and spend quite a lot of time doing music with young people, not least my three sons who all play Scottish music. 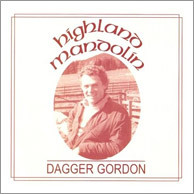 Dagger Gordon - Highland Mandolin, from 1988. For styles, we have a really old tradition of Gaelic song and piping alongside modern "Celtic" bands such as Run Rig, Capercaillie, Wolfstone, Shooglenifty and several others. It has always been quite interesting to me that these bands have mainly emerged from the Highlands and Islands rather than the cities. Tune types? Jigs, reels, 2/4 marches, 6/8 marches, 4/4 marches, strathspeys, Highland Schottisches, waltzes and airs. Hornpipes perhaps to a lesser extent than in Ireland. Dan Beimborn: What can you tell us about your current recording project with your son Colin? How did you approach the recording and what music goals did you have? Dagger Gordon: Colin is a very good and very interesting musician. Apart from the guitar, he also plays the bouzouki, and to a certain extent the pipes, the flute and a stringed instrument from the Middle East called a tar. I should maybe say that despite our relative geographical isolation, we are really into world music and listen to all sorts of stuff. I felt it was time for me to record a new CD, and we had quite a lot of material worked out as a duo which I wanted to record, so it was an obvious thing to do. I decided to concentrate on old Scottish material. There were several reasons for this. One reason is that there has been a tremendous amount of good Scottish tunes written in the last twenty years or so by composers like the late Gordon Duncan and several others. While it is absolutely great that we have so many good new tunes, I began to feel that some of the old ones weren't getting played enough and it would be good to give them an airing. For the actual recording, we played the tunes live in the studio. We only used two instruments: my Sobell mandolin and Colin's nice mahogany Martin guitar. Our music goal was simply to play these wonderful old tunes as well as we could. No overdubs or guest musicians, just us! Dan Beimborn: You were recently featured on the Collings web site. Steve McCreary, their production manager was thrilled to listen to a sample of your music. That along with your recordings (Scott Tichenor who runs this site tells me he hears you on his local NPR station in Kansas on occasion) and new book, you've carved out quite a prominent role as a musician. Does that thought ever cross your mind as you're tending your farm, that you've shared a fair bit of Scotland's music about the globe in places you may never learn of? Dagger Gordon: Well frankly, no! I'm surprised that anyone would know me in Kansas. It's funny, isn't it? I don't travel out of my local area very often with my music, but I guess with the internet - and particularly with such a wonderful site as Mandolin Cafe - it is possible that people from all over the world can know quite a lot about your music and indeed about you as a person. I think that's pretty good, really. I must try to do some gigs in the States. I'd like that. My wife is from New England, and has lived in Scotland since 1980. David (Dagger) and Julie Gordon in the Highlands of Scotland. Dan Beimborn: What kind of opportunities are there to learn directly from you or to hear you perform? Dagger Gordon: The only adult class I teach is at Feis Gleann Albainn in Fort Augustus, by Loch Ness, which took place in February. I do a lot of youth teaching, mainly with two organizations called Feis Rois and The Gizzen Briggs. Feis Rois is an organization which does a lot of stuff with young people, and I do regular classes on Thursday nights for them on guitar, group work and mandolin. In the group work class I have a number of kids doing mandolin along with guitars, fiddles, whistles, etc. They do also offer an adult residential long weekend with some great tutors, but I'm busy calving cows then and can't do it. I also take music into primary schools for Feis Rois as part of a program called Youth Music Initiative. I spend most Monday nights with The Gizzen Briggs, a 50 strong (yes, fifty!) traditional music group based at Tain Royal Academy, where my kids went to school. The standard is amazingly high and I really enjoy working with them, doing arrangements and helping the mandolin and guitar players. So there are not that many opportunities to learn directly from me at the moment. I have been toying with the idea of offering some sort of weekend workshop but I'm really pretty busy doing other things. For gigs, there's usually various things on the go although quite a number are private functions. I also quite often play a session in a bar in Inverness called Hootananny's on Wednesday nights. I think we have the potential to get a lot of young people playing the instrument right now. I must give a plug here for the Lanarkshire Guitar And Mandolin Association who are doing a quite remarkable job and are literally teaching hundreds of people how to play. I have also noticed an increase of interest in the mandolin in the young musicians that I work with. The mandolin isn't necessarily people's first instrument, but it seems to me that many more guitarists and fiddlers are now using it as a second instrument and that is something on which we can build. Dan Beimborn: What's in your immediate future in terms of your music? Dagger Gordon: Right now I'm pretty much 24/7 doing the lambing, so music takes a back seat for a few weeks. But the next step is clearly to get the new CD with Colin out, get photographs taken and (finally!) do something about having a web site. I would hope to do a few gigs with Colin later in the year on the back of the CD, which I'm pretty happy about actually. In the meantime I will carry on with my gigs in the Highlands. I have a long-standing line-up with ex-Battlefield Band piper/guitarist/multi-instrumentalist Duncan MacGillivray and a fiddler called Iain MacBeath. We play a lot of gigs in Skibo Castle, where you may remember Madonna got married not so long ago. It's a club for the rich and famous, and they put on ceilidhs every week, so it suits us fine. I also do a lot of work with an accordionist named Melanie Simpson, and have a couple of other different line-ups. I consider myself really quite a lucky man. I would like to finish by thanking you very much for taking an interest in my music. I feel extremely honored to have been asked to do this interview. Really looking forward to Dagger's new recording with son Colin and great to get a wee taster of it via the mp3 that accompanied the interview - great stuff altogether! What a great interview. Dagger's a first-rate guy as well as a great player, and nice to see a photo of the happy couple, too. Well-done all around! Enjoyed the interview and music. As great as it would be to hear Dagger live here in the States, it would be even better to take a vacation to Scotland and hear him live. For now I am working through his latest book and learning a lot. I am sorry to say this is the first I have heard of Dagger. I can understand his lifestyle getting int rh way of his music. I have a small farm and raise horses. I enjoyed the videos and I will have to search You Tube. I too will add Dagger's Scottish music book to my list of things to pick up next time I'm in Scotland, which should be fairly soon. I went to the feis in Fort Augustus in February, and it was a real pleasure to meet Dagger and learn about his approach to music/mandolin playing. I have to say that as well as the mandolin instruction, Dagger was quite the raconteur, his storys mostly about highland culture which really added to the whole experience. At the end of the feis, Dagger kindly dropped me at Inverness train station and I heard a sneak preview of the forthcoming recording (which was sounding very nice). Dagger, you're a top man and I hope to run into you again. Wonderful interview. Thanks so much! and the MP3s are really wonderful. A top Jock - get his cds they are excellent! Just picked the book up from Elderly today. Enjoyed reading the interview. It brought back our visit to the Highlands a few years ago. Dagger has been around a long time, I have a long playing record from 1985 called ' Dancing Hazards ' by the band Black Donald, featuring a very young looking Dagger playing superb mandolin, cittern, tenor banjo and tin whistle. The folks at Elderly tell me they've sold out of Dagger's book but that more are on order and should arrive by May 3. I think it'll likely be sooner than that. ScotlandMusic.com also has them in stock. I've ordered from them before and it worked just fine. Thanks a lot for all the kind comments everybody. It was a real privilege to do the interview. Och! Ta play just a fifth that good would amaze me! Enjoyed reading the interview. I'll probably get all his books and tutorials! Noting the anniversary of this fine interview published this date 2011. Noting the anniversary of this fine interview put together for us by Dan Beimborn!